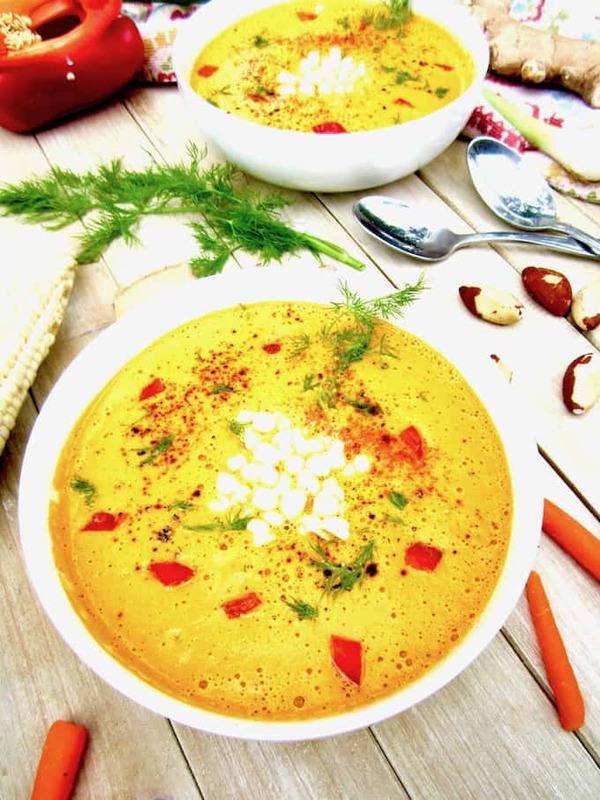 Creamy, refreshing and nourishing, this raw soup is both nutritious and highly delicious! Can also be enjoyed warm for a non-raw version. 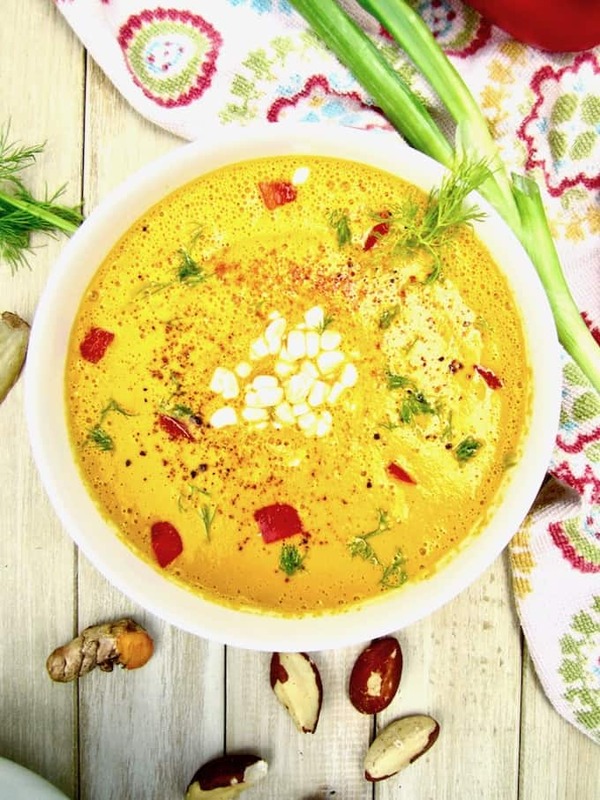 What’s more spectacular as the weather is heating up than a beautiful, seasonal, raw soup? 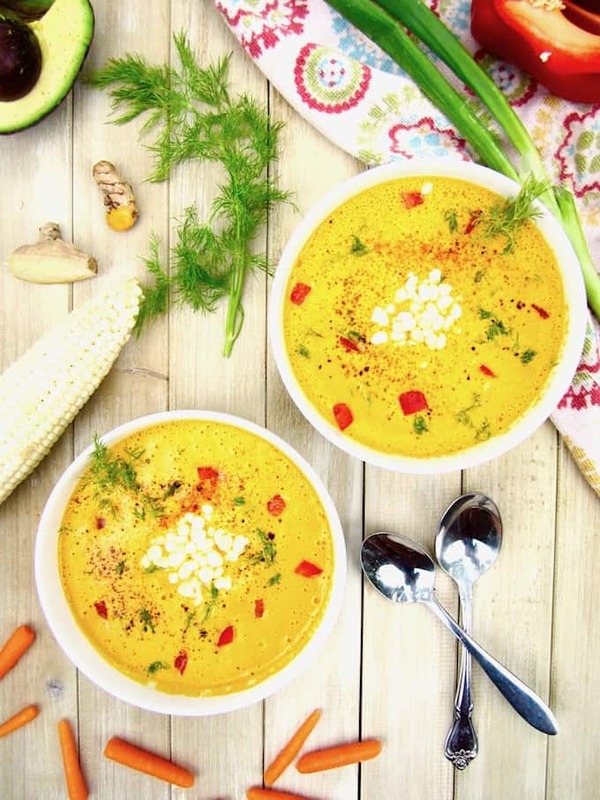 This healthy, cold soup is creamy, flavorful and refreshing, plus has a little foam at the top from the blending process to make it extra special.You can eat it cold and raw, or heat it up until just warm for a non-raw rendition. I’ve republished this recipe (with permission) out of Mark Reinfeld’s awesome cookbook Healing the Vegan Way, and also had the joy of attending his workshop and teacher training in Portland last month. More on that below! But first… ‘What’s the point of eating this soup raw or not?’ you may be wondering. I’ve felt inspired to learn more about raw foods recently, so here’s a brief rundown for you! WHAT ARE RAW FOODS ANYWAY? A Raw Food or “Living Foods” diet is based on the principle that food is best eaten in its most natural state, meaning uncooked or cooked on very low heat, as well as unprocessed (or minimally so). While there are purists who eat 100% raw, this diet typically isn’t all-or-nothing. There are various renditions of this diet depending on what people find to work for them. For example a ‘High Raw Diet’ is 75/25, meaning about 75% of your foods are consumed raw, and 25% cooked. Raw foodies focus on the high nutritional density they receive from consuming high levels of fruits, vegetables, nut and seeds. Raw food is prepared by dehydrating (no more than 118 degrees Fahrenheit max), chopping, blending, juicing, soaking and sprouting. Living foods have micronutrients and natural enzymes that are critical for building proteins and rebuilding the body. Raw food advocates explain that heating the food destroys these enzymes that are needed for digestion, and can alter the food’s vitamin content as well as leaving toxic materials behind. The benefits of a proper raw food diet include high levels of energy, increased health and mental clarity, clear skin and a slim figure. You, like many, may be skeptical or wary at the thought of only eating raw foods. I feel you! Plus, with the abundance of different diets and food philosophies out there, it can get really overwhelming and daunting to adopt any particular ‘diet’ or lifestyle. I’ve gone through my own frustrations recently because there is so much conflicting research about just about EVERYTHING food related that I was getting in a total spin, to the point where I found myself incapacitated to even make a decision about what to eat for dinner. No fun! ? You can’t go wrong eating more fruits and vegetables. There are benefits to eating some raw fruits and veggies every day. Eating a diet consisting mostly of natural, ‘real food’ that comes from the earth (vs. the factory or lab), that is minimally processed is most nourishing and healthy. There is conflicting evidence for just about every diet and lifestyle choice, often (sadly) based on who is funding the research and their agendas. You can ‘prove’ just about anything. I can trust my body in guiding me to what feels good to eat, and what doesn’t. A whole foods, plant based diet is healing, life sustaining, planet saving and animal compassionate. These are beliefs I have based on my own experiences and values. It may be different for you, and that’s OK! I encourage you to find YOUR own truths around your food choices that feel good to you and honor your body. As mentioned above, I recently had the delight of attending one of Chef Mark Reinfeld’s Vegan Fusion workshops called Healing the Vegan Way. 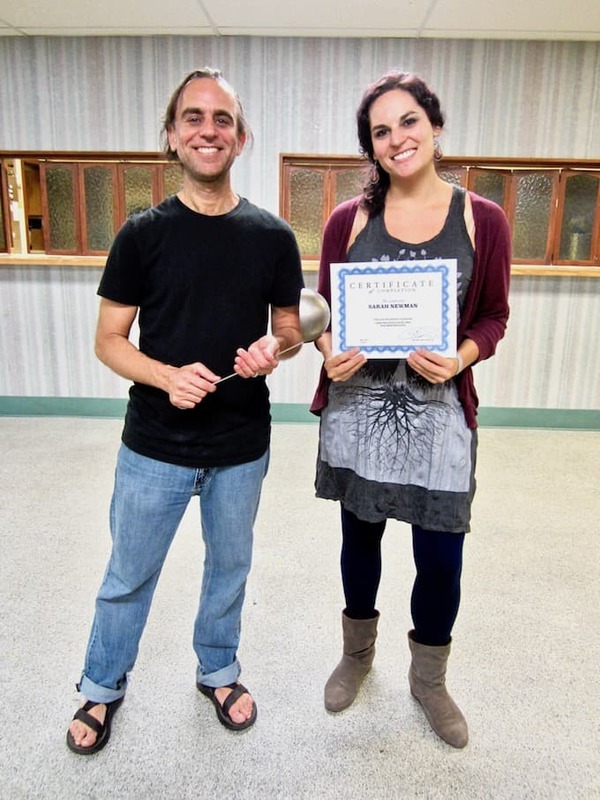 For those of you who regularly read this blog you’ll know that, back in March, I raised money through a crowdfunding campaign to be able to attend one of Mark’s teacher trainings in Portland last month and am now a certified Level 2 Vegan Fusion Chef!! ? Thank you, again, from the bottom of my heart for all of you who lovingly and generously supported me financially and through your encouraging words! This incredible experience would not have been possible with YOU! Mark, a leader in the vegan food industry, is a very humble teacher who is easy to learn from. He has a positive, cheerful attitude and compassionate heart, seeing food as a form of activism. After all, we make choices multiple times a day of what we’re going to put into our bodies and where we’re going to spend our money. Thus, those of us who feel called to spread awareness about the vegan lifestyle in relationship to health, sustainability and animal rights in turn support others in questioning the status quo, and making more decisions that feel good, nourishing and empowering. I learned so much over these 6 days, felt inspired and connected to my ‘why’ of wanting to bring healthier, plant based eating to the masses! 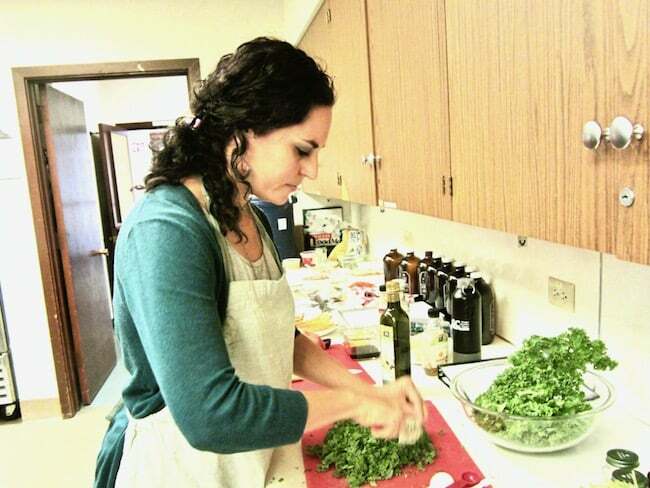 Me prepping a raw Curry Kale Salad for my teacher demo! I was very touched by the stories of some of the attendees at this class. A woman talked about getting diagnosed with diabetes and how her numbers have already drastically improved in a short window through adopting a vegan diet, and others shared similar stories about heart disease. It’s amazing to me how none of their doctors recommended a plant based diet to them; they all found this solution through their own research and interest. It seems so obvious to me that food can be our medicine… but hey, I think we can all at least celebrate how much more access we now have to information than ever before about how to heal and thrive naturally. It’s an amazing time to be alive! 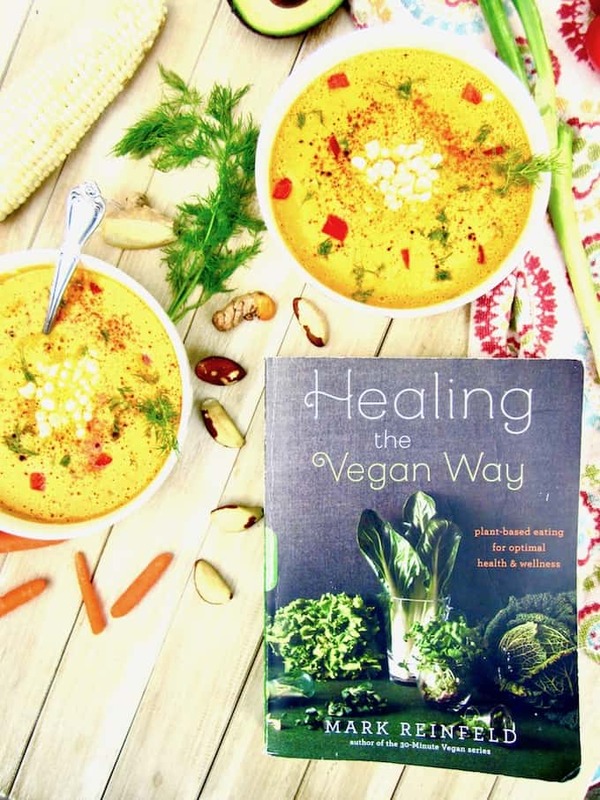 Today’s recipe comes out of Mark Reinfeld’s cookbook Healing the Vegan Way: Plant-Based Eating for Optimal Health and Wellness . I absolutely LOVE this cookbook! I’ve tried quite a few recipes out of it and am always pleased with the nourishing results. The majority of the recipes have simple, clean ingredients and Mark teaches you how to view the recipe as a template vs. an exact science, so that you can learn to substitute whatever ingredients you have on hand and really get creative! In the book, Mark has a plethora of information about the healing properties of a variety of plant based foods, and has useful charts that tell you what foods to eat for different health ailments (digestion, heart disease, etc.). GET 40% OFF MARK’S NEW ONLINE COURSE! Each course is comprised of in-depth videos that you can complete at your own pace, and you’ll also receive recipes, interactive photos, fun quizzes at the end of each lesson, a private Facebook group AND, if you complete everything, you’ll be rewarded with certification as a Level 1 Vegan Fusion Chef! Watch the video below for more information. AND FINALLY, BACK TO THIS RAW SOUP! It’s easy – just toss all ingredients into a high speed blender and you’re ready to eat. Let me know in the comments below if you try this recipe and what your thoughts are on raw food! Place 2 cups of the carrot juice in a blender. Add all the remaining ingredients except the corn, red bell pepper and dill, and blend well. The shelf life is 2 days. This makes 6 servings so cut it in half if you wont use all 6 servings in 2 days. *I got the fresh carrot juice at Trader Joes for $3.69/quart (which = 4 cups, exactly what this recipe calls for). **The original recipe does not specify a need to soak the nuts, but I did soak them in water for a couple hours ahead of time to support blending and digestion. After soaking, be sure the drain the water and rinse the nuts before using. For the brazil nuts, you can substitute cashews. For the garnish, I bought fresh corn at the farmers market and cut it off the stalk. You can use whatever veggie garnishes you'd like! Also sub whatever other herbs you love for the dill. This post contains affiliate links. 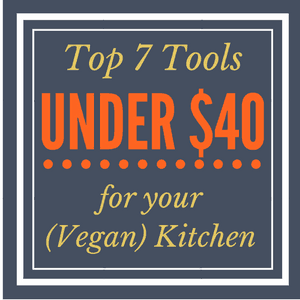 If you make a purchase on Amazon or with the Vegetarian Times after clicking one of my links, your costs stay the same but I receive a small commission to help support Vegan Chickpea. Thank you for your support! Ooh thank you so much Mari, so glad to hear this! Would love to hear how you enjoyed it?! Thank you for the great recipe and the cookbook/course recommendations! We will be trying it very soon! Awesome to hear Matt! Thanks! Great use of brazil nuts there! I never use them very often! Oh my gosh, this looks like my kind of soup. I love soup in the summertime. Yay! Yes, cold raw soups are so refreshing! wow such vibrant colors! Love the shots of you cooking in this post! Hi Marcia - thanks for your feedback. I'm looking at options to incorporate nutritional info into my recipes. Thank you and I hope you enjoy the recipes!